Angela Federico and Matthew Demello chose the Venezia Waterfront Ballroom to host their dream New Year’s Eve wedding reception with 232 guests. The celebration began at 7 pm in the Grand Foyer for the cocktail hour. Then guests convened to the Waterfront Ballroom for the main event, where they enjoyed amazing food and dancing until 1 am. Angela recently sat down to share the details of her and Matthew’s reception with me. Don’t miss their video below. Q. How did you decide on the Venezia for your wedding reception? A. We looked at a few spaces, and many of the other venues had the event space cut up into different rooms. What we loved about Venezia was that everyone was together in the ballroom. Q. What about the space did you love the most? A. Venezia allowed us to use the ballroom space like a blank canvas. We transformed the entire space to our vision and brought in a lot of furniture including couches. Q. What were your first thoughts about the space when you walked in on the evening of your wedding? A. When we walked in, my knees buckled, and I almost collapsed. It was everything that Matt and I pictured and more. Q. What was it like working with Venezia to plan your dream reception? A. Brenda Seekins was our fairy godmother. We had a specific vision and a high level of detail for our reception. She was there to see it all come together. When Brenda received ridiculous quotes on furniture rentals, she went vendor to vendor until she found a reasonable one with the best quality. Brenda was incredible. Q. 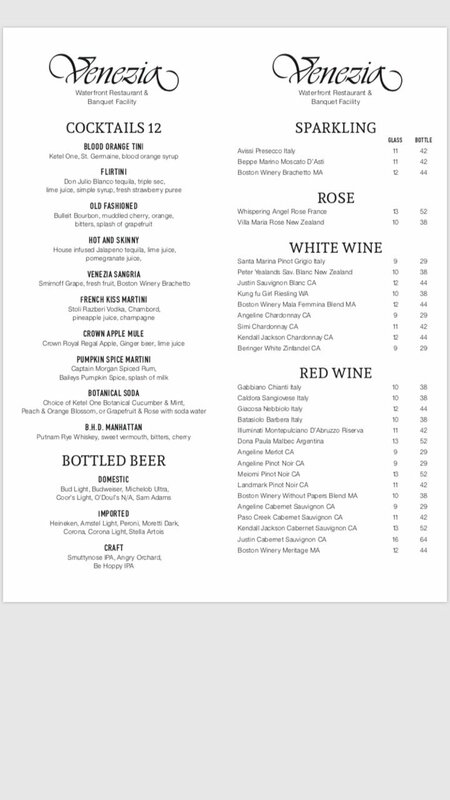 Tell us about your menu? A. We chose to forgo a traditional sit-down meal and opted for passed hors d’ oeuvres throughout the evening and food stations that were replenished. We also had a taco bar, Chinese food, and a dessert table for late-night snacking. Our families are Italian and Portuguese, and food is important to us. We wanted our guests to really enjoy the food. To this day, we have people telling us how good the food was, even the ones who expected a traditional wedding meal. We also asked the Venezia to box up slices of our cake for guests to take home instead of serving it at the reception, since the cake doesn’t always get eaten at weddings. Q. How did Venezia's staff meet or exceed your expectations? A. The staff was phenomenal and worked very hard throughout the night. Since our menu wasn’t traditional, there were a ton of small plates that the waitstaff collected. We never saw one dirty plate left out. Q. Is there anything else you’d like to add? A. There isn’t one thing we would change about our wedding. Brenda and the entire team at Venezia were incredible to work with, and they helped to make it the best day of our lives. The food was unbelievable and everything we hoped it would be.